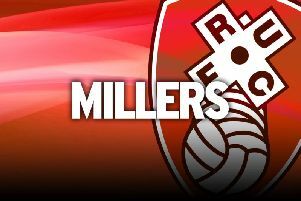 Rotherham boss Paul Warne rued his lack of ability to change the game from the bench, after his side lost to Leeds United. The Millers put in a spirited display against the league leaders on Saturday and were heading for an unlikely three points after Semi Ajayi's stunning opening goal until Mateusz Klich's second-half double inspired the visitors' comeback. Warne has been robbed of potential game-changers Joe Newell, Ryan Williams and Jamie Proctor to injury while Kyle Vassell is still making his way back from a troublesome groin problem. That left the Millers boss with little options in his list of substitutions, having to put Jerry Yates, who was culpable for Leeds' winning goal, in a left-wing position. "I'm not making excuses but I am making excuses," said Warne. Klich's goal was a real tough one for the Millers to take and Warne visibly showed his disappointment. Yates, a striker who has spent the first half of the season on loan at League Two Carlisle, was robbed of possession in the 86th minute and the visitors went on to score. “I thought from the lads' attitude and sticking to the gameplan could have been enough to come away with a positive result. “Nobody expected us to win this game but I thought the lads gave everything they had an predominantly made all the right decisions. When their second goal went in, that was probably the most I've ever reacted to conceding a goal as a manager. It did feel like a right sucker-punch. "You don't ever give away possession needlessly. It's about the pressure Leeds put you under. You're more fatigued and it's harder to make the right decision at times. “It did feel like a right sucker-punch. A point at home to Leeds would have been a good point.